Boo! I told you I loved Halloween! It’s October 1st, the beginning of my favorite month of the year! What would a Halloween celebration be without Blood Red Punch? It would be boring, that’s what. Seriously, a Halloween party needs a scary drink. However, if you are a Halloween nut like me, you don’t need a party to make a wicked drink. This punch is kid-friendly (alcohol-free) but can be easily transformed into an adult beverage. The spiders require a little forethought. The day before you want to make this punch you will need to make the spider ice cubes. Fill an ice tray with water and place washed plastic spiders into each cube. Have the spider coming out of the ice, kind of like 3-D. Besides the spider ice, you will need: Cranberry-raspberry juice blend, sparkling water, frozen strawberries, crushed ice and SUGAR! The sugar did not make this photo…oops! This punch without sugar would be sour. Is this picture bloody-scary or what? You will need to puree 1 cup of strawberries (or raspberries) with 1/2 cup granulated sugar. In a pitcher or a punch bowl combine 3 cups cranberry-raspberry juice, 3 cups sparkling water and pureed fruit mixture. Place crushed ice in glasses and then fill up with punch. Add a couple cubes of the spider ice and you have a scary-bloody punch. Kids and adults will love it. To make this an adult beverage, just add 1 cup of Vodka…or more. Just bring me a big straw…slurp. 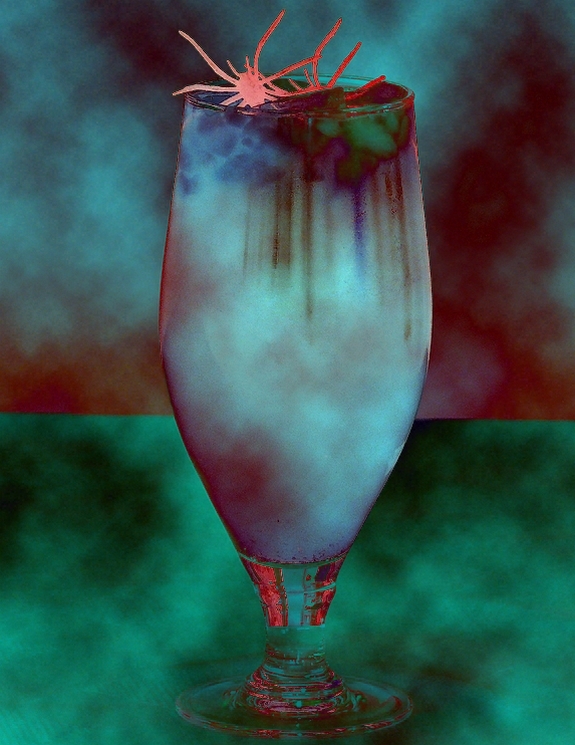 And here is a virtual cocktail napkin for you…creepy isn’t it? I’m going to attempt to a post a daily picture with some type of Halloween decoration at the end of my post. I have so much Halloween paraphernalia I might as well entertain the world with it. Aren’t you all lucky! This is our Halloween Countdown Calender from Pottery Barn Kids. It’s very big and hangs on the back of a door. There is a square for each day of the month where a treat for each hooligan is held. You must know when I bring this out, the kids go absolutely berserk. They are so excited they can hardly contain themselves. This also stops them from asking me how many more days until Halloween…that’s the best part! Oh yes please entertain me with Halloween decorations! I wouldn’t mind being entertained with that candy and punch either! Nice tray! Scary, but nice! Go check the dessert now! Spiders are my one big phobia….but I also know my grandkids will love this, especially the thrill inducing spiders creepy crawling all over the punch ! KathyB. I have never seen that Halloween count down calendar before. I totally love that. And spiders in the ice? Oh yeah. I’m doing it for my classroom Halloween party. I’m such a cool teacher. HOW FUN it must be to have you for a mom! Love the countdown calendar!! I finally met someone who loves Halloween as much as I do….so much so that she even makes a Halloween drink. YOU ROCK! I like the door count down calendar thats just too cue and I can see why the kids would love it CANDY! The cake looks nummy , as does the spider drinks, and since I’m a touch of an arachnophobe, those spider ice cubes would clinch it! What great ideas – the spider ice cubes are creepily fun. I’ll be stealing a few of these. Very cool punch. Love the spiders! I will enjoy your cute pictures at the end as well. The “Advent” calender is a hoot! Every year I have a Halloween party for the kids and their friends.. 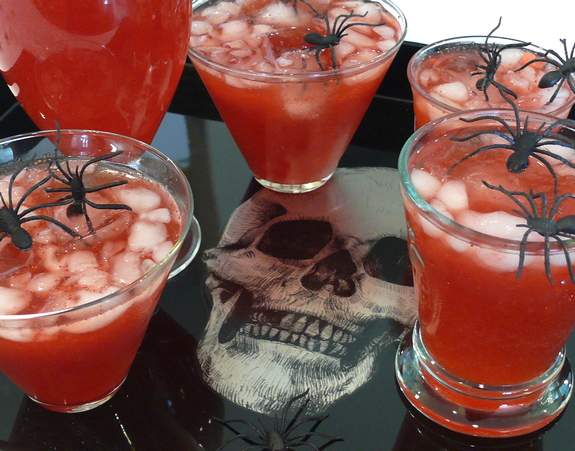 I will DEFINITELY be making the punch with the spiders… I love that idea! Also, I want that Halloween Countdown calendar so badly! My kids would love it! As Boo has gotten older, and for other reasons, I have stopped having a Halloween party. But with the punch and candy corn cake, it makes me want to have a party just to make those. Thanks for the ideas. Love the frozen spiders! Your sons are the luckiest boys on earth to have a mother so into Halloween! I saw the photo of the candy corn cake but not the recipe. What kind of food coloring would I use to dye the cake those brilliant colors? I know that punch is good! Your holloween desert looks like so much fun, and the spiders in the ice, well, tons of fun! I too love holloween, and when the kids were home we went all out. Sad to say the majority of the grandchildren live too far away to make it here for holloween. But, i do have two of them here! It’s one of my favorite holidays too! I can see I’ll be enjoying this month on your blog! this is totally amazing! you are truly the spirit of Halloween. such a good idea with the ice cubes. And, I love love love your candy corn cake. Candy corn is one of my favorite foods. This must be a fun time in the Pig home! I think the punch would be a lot of fun in the new LED “glasses” (they are plastic glasses that light up). WICKED CUTE!!! I’m on the edge of my seat for more!!! I LOVE Halloween too! I just got back from HALLOWEEN AND VINE fair in Petaluma and bought great things! This will be fun to serve on the table with my new decorations! You’re the QUEEN CATHY! Forgot to mention… that last photo of your drink, where the spider looks orange… is A-M-A-Z-I-N-G! A Halloween advent calendar. I think I love you :). Do you think it would be okay to have one of those in a house without children? I can’t wait to see what other treats you post this month. That drink looks great! I love the spider in the ice cube…great idea! And your Halloween countdown calendar is awesome too. Very cute! Paste Food coloring. Available at WalMart in the cake decorating aisle or from a cake decorating store. So I was sitting there reading the recipe thinking, “What, no booze?” Then you came in and saved the day and mentioned the optional vodka. I am SUCH a lush. That’s the problem when you don’t have kids. You don’t actually consider that you might have to actually be serving kids and that you can’t give them booze. My husband would LOVE your cake. He is a candy corn nut. (I just realized that could also be interpreted that he is not just a lover of candy corn, but also a Corn Nut made out of sugar.) I should seriously consider doing some Halloween baking for him. His birthday is pretty close to Halloween after all. Arachnaphobia (n): see picture of Marjie. Your spider cubes would freak me out; just the picture did the job pretty well. I like your Halloween countdown calendar! Your cake is vivid. Have you tried making a chocolate cake with cholocate icing, green frosting “vines” and pumpkins planted on top? My kids just love it – pumpkin patch cake usually hits our table when we go to the farm to get our pumpkins! What does it say about me that my first thought was “needs alcohol?” Love the spider ice cubes – I need to find our ice cube trays. I notice the first 2 pockets of the calendar don’t have dates. I think the rule book states those candies are for mom. Those are great ice cubes! It is fun to remember how oddly inspiring Halloween can be in the kitchen. I love it! We’re having a Halloween party here at work and we always go nuts. This will be perfect to serve! Love the candy corn cupcake recipe! I think I will make them for my granddaughters preschool. Thanks for sharing. Eeeck…. there’s spider in my drink! I guess it’s perfect for halloween party! The spiders just make the punch-so very neat! Love the countdown hanger too. Oh, you do have a wicked sense of humor! I love the spiders in the ice cubes! How fun! Uh. Will you be my mom? LOVE the ice cubes! What a great idea! love love love the spider ice cubes. My kid is so into creepy! Never, in 9 years has she wanted to be a princess or a gypsy, nothing girlie. This year? Shark attack victim! This concoction is right up her alley! mmm…I’d love to make these into adult drinks! 🙂 The calendar is adorable…you’ve got to be the coolest mom ever! My Mom dreaded Halloween thinking about all the candy I’d be eating. Thanks a bunch..my 5 yo son saw me reading your post..and saw your halloween calander w/ the candy. Well…he wants to now live with you! This is a brilliant idea! I think I may have to do this for our school party. Thanks for the tip! Antioxidants and vodka and Halloweenie motif?!? SOLD! FINALLY someone who enjoys Hallowe’en as much (possibly even more? Is that POSSIBLE?) as I do! WHEEEE!! I’m so excited to see your October posts! Seriously, you are adorable. I love that you make the spider ice cubes for the Hooligans all through October, and that you have the special candy calendar, and taht you have such a delicious-sounding drink, too! Hey! Those candy corn cakes are SO CUTE! I wish I was half as creative as you. The teachers would love me if I made desserts all the time. My daughter loves Halloween (so do I). We just decorated the house yesterday and today she is working on more creepy artwork. She would LOVE this punch and I just happen to have some black plastic spiders. Great recipe! Absolute total agreement on Halloween. I love it. Maybe it’s just because I grew up in San Francisco, where everyday is like Halloween and then on Halloween they just go all freaking out! Now I’m a mom, I get my kids dressed up and go out with them. My oldest is scared of anything Halloween, he can’t even go down the Halloween aisle at the grocery store. When he goes with me , he says, “Mom, you go ahead. I’ll meet you on the next aisle.” And he’s going to have his first school Halloween this year! I’m going to go crazy! Can you please come and make me this drink? I’ll have you home for Halloween. 3, yes, 3 of my kids are born this month! Halloween makes it soooo easy. This year all the kids will get to carve pumpkins! That Halloween calendar is adorable! I love Halloween too – especially carving pumpkins. Great idea with the spider ice! a halloween advent calendar, how fun! i’m going to make this drink on halloween night with my brains pasta! This is so cute and I love the october calendar for the kids, this is great Cathy!! this is so fun! Any other tips you want to share in re: to ideas for a kid’s halloween party? We might try the punch. I have to find a supply of spiders. I think the countdown calendar is a great idea. Happy to see that someone else out there loves October and Halloween as much as I do. I’m going to try this punch. It does look good. Also, didn’t I just see that skeleton tray at Pottery Barn today? And would you believe, I have those excact same glasses with the little bee on them? I love those! Adorable and delish! We make something very similar to this. I’ve always frozen things inside the cubes, never 3D style. Great idea. You are so inspirational!! You so put me to shame. I need to dig out my decorations before the day of! the advent calendar is darling! my kids fought over my christmas version well into their late teens. i love it. Oh dear, those look quite refreshing. Could have used one of those this afternoon! Okay, now you’re starting to make me look forward to Halloween. I guess it’s more interesting now that we have a kid. More decorations!!!! Love the calendar. LOVE the drinks. Oh, and remind me to tell you about the time I stole spiders from a Rite Aid. Wait. That’s it. I stole spiders from a Rite Aid and I didn’t mean to. Hmmm…funnier when I tell it out loud. So working on the “adult” version of your creepy drink. What a nifty idea. I have never been much of a Halloween person but now that I have kids I can feel myself getting into it. My kids would love these ice cubes. I LOVE your candy corn cake. The colors are perfectly matched to the real stuff! Get to the chocolate stuff and quick! so are you going to snap some shots of this crazy house decorating job? Curious minds want to know? LOVE the ice cubes! they would be a hit with my son and freak out my 4 daughters which is why i love them so. i’ll be doing this for sure. Bloody scary 😉 yet totally delicious! love the spidery topping, such nice touches you always do! Mmmmm! Those look good AND spooky!! That Halloween countdown is so cute–I’m sure my kids would try to eat all the candy at once though! I think I love you I need to plan my sons class H party and I love these spider ice cubes and slushies!!! I love Halloween! The kids and I just made ourselves an advent calendar. They are loving it. Yours is cooler though. Second, oh sister oh Halloween friend, let the fun begin! Third, I have to make those ice cubes for when the kiddies come over! And I might even bake the candy corn cake *g* Great Idea! I LOVE Halloween too. What a darling countdown calendar. My son would go bananas over that. Wish I could invite you to the Halloween party that we’re going to this year… 500 people at a 15,000 square foot mansion. It’s an amazing party where all of the proceeds go to a charity. Our friends used to own one of the big Halloween costume companies so they totally know how to do it up right. And there’s an open bar. They should be serving these cute spider drinks. CUTE idea! And I love your candy corn cake idea too. So creative! Halloween countdown calender…you kids have the fever! I’ve got this one too and it’s crammed with candy for our countdown. The bad part is that now I want the Thanksgiving one too. Just dropped by Davis Life. That candy corn cake is wonderful looking! Those spiders are so creepy!!!! I LOVE IT! You are so creative. I just found your site and intend to look around a bit. I love it! I love the ice cube idea! The punch sounds yummy, too. My daughter is an absolute nut for candy corn. I showed her that picture & she nearly squealed! It’s a must bake for me. I need to pick up one of those calendars. My kids would love having that here & so would I. Cool idea! Well, it must be a year since I have been following your blog because Halloween is how I found you!! I love your decorations. So what are you going to be this year?? ?